4. How to save Impacts ? 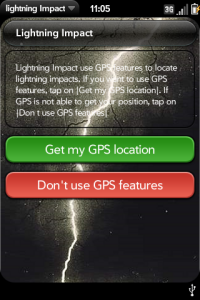 This app uses your GPS location to locate lightning Impacts. Press the green button to get your GPS location. If GPS doesn’t work properly, you can either choose not to use GPS. 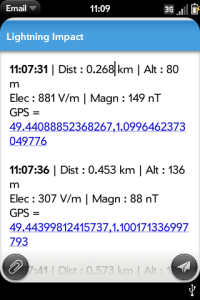 In this case, your GPS location will be set to (0,0). 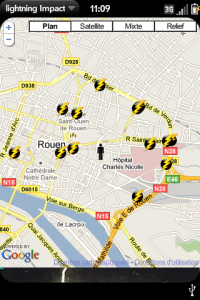 You will still be able to use lightning maps, but lightning gps location will be given as an indication. A flash of lightning, followed after some seconds by a rumble of thunder is, for many people, the first illustration of the fact that sound travels significantly slower than light. Using this difference, one can estimate how far away the bolt of lightning is by timing the interval between seeing the flash and hearing thunder. Press the green button when you see a lightning, press it again when you hear thunder. 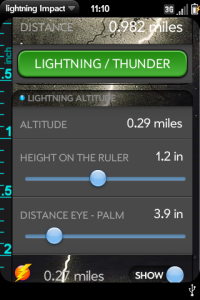 To calculate the altitude of lightning, hold the Palm in front of your eyes towards the lightning…. 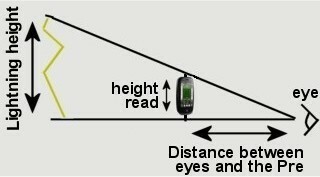 If the flash is over the screen, you must reduce the distance between your Palm and your eyes. When lightning strikes, use the ruler on the side of the screen to measure the height of the flash. 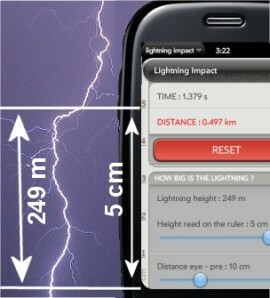 Lightning Impact calculates for you the lightning altitude ! How to save Impacts ? Tap on Save button, all the saved impacts are available below in the saved impacts box. Press “show” to open it. 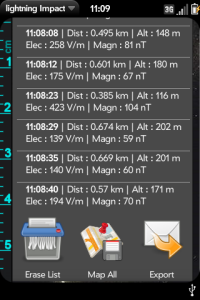 To map each saved lightning impacts, tap on the each item. You can either choose to view one lightning impact on the map, or to view all impacts saved previously. TIP : Double tap on the map to zoom in. This app allows you to export with email all data stored in the phone. 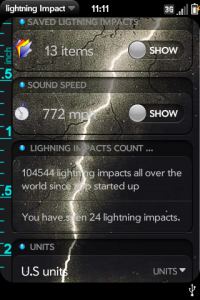 Press export button in the saved lightning impacts box. Electromagnetic field are calculated here where you stand. In order to calculate very accurate distance values, please enter the temperature. Scroll at the botom of the screen to change units. If you need help, please, leave a comment. ← AlcoTest Update 1.2.0 ! What's New ? Hi I would like to know where you got this layout from, I want it!